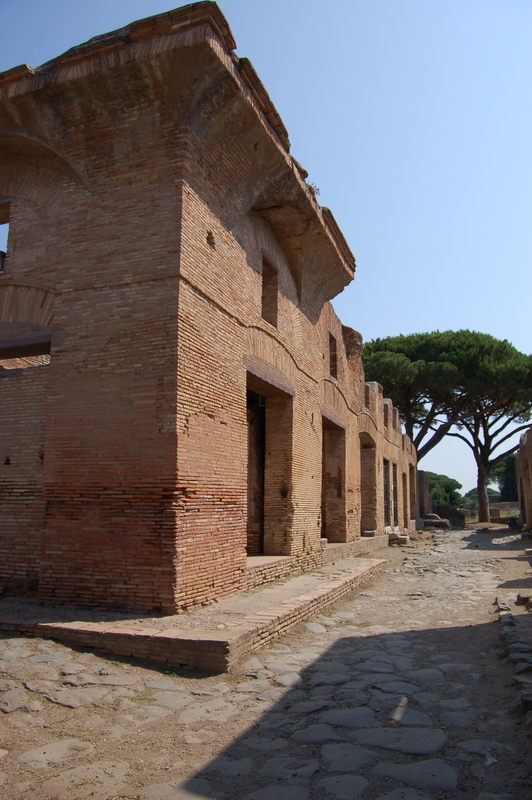 Currently, I’m still working on my chapter covering internal acoustics of various spaces in Ostia. My last post touched on the role of doors in shops, one of the spaces I analyse, and now I’m working through the various forms of residential structures, mainly houses and apartments. I pulled an older study of apartments and houses in Ostia off the shelf and started going back through bits of study, especially the authors discussion of particular apartments. While the architectural discussion was useful, I was more fascinated by one of the appendices, which had every building in Ostia with the authors calculation of inhabitants. Each building had a suggested height (# of stories), number of flats and total number of inhabitants. This was just the sort of random list I find fascinating and started playing around with the population numbers. Where was the densest population in the city? Which building had the most people? What was the average number of people per building in each of the five regions of Ostia? And finally, what would the range of noise levels if I ran the population numbers through a crowd noise prediction formula? This final question lead me to start yet another spreadsheet with the all the buildings and their corresponding crowd noise prediction levels. As expected the range of noise levels was fairly consistent, as the per building population numbers were also fairly consistent. But once I had my spreadsheet, I figured I would map the predictive noise onto a few neighbouring buildings and see what would happen. I quickly realised that I had a couple of problems I need to address. Was I going to assume all the inhabitants were in the same space, as the crowd prediction formula assumed, or would I rerun the formula for each individual habitation on each floor. Thus, and for the sake of entertainment, I assumed that each building had it’s own ‘house party’ with all the inhabitants from that building in one flat! It was perfect! An ancient frat party in each building and now I had something even better to find in mapping the sounds. Where would you go to read a book away from all the noise? Having looked at the acoustics of the internal spaces and having worked out the noise levels for my ancient ‘house party’, I sought to find the quietest place where my ancient equivalent would go to get away from all those people. I’m not sure how my supervisors will feel about my referring to crowd noise predictions as ‘house parties’ but it was entertaining.